Sell My Car For Cash Fast » Blog » Car Maintenance Tips » How To Maintain A Car? If you own a car and are driving it around for a long time, you know how important it is to maintain it. A car requires all the care and maintenance for its proper functioning. Moreover, your duty does not end at paying the bill of your vehicle. You also have to take proper care of it. Besides that, safety must be your priority.You must know when it’s time to take your car for a garage visit. More than anything, you have to make sure that your car is safe for the people you carry around in your car. Instead of putting yourself in a serious situation, it is advisable to take all the preventive measures. Mentioned below are a few things you must follow to ensure each drive is a safe drive. You must know everything about the light signals that might blink in case of some default. Your car always warns you about any unusual happening in the car. Make sure you read the manual of the car for such light signals. You must always keep the manual of your car in the glove compartment. Keeping the manual in handy will help you recognize such signals when any light starts blinking. These light signals consist of brake warning, engine service light, ABS warning, electrical fault light and so on. Tyre pressure is one of the most important things to check. You can only drive safe when your tyre pressure is right. You must check the tyre pressure more often to make sure you do not face any tyre blowouts. Also, you must be extra careful about the tyre pressure during winters. Despite the availability of tyres that come with a great design and can adapt to any weather condition, keeping a check on the tread death is extremely important. Thanks to the new tyres that come with a tread band which warns you. You know it is time to replace a tyre with the help of tread bands. If your tyre doesn’t have one, make sure you check the tread depth regularly. Besides being safe and keeping your car well-maintained, you must also make sure that you are not spending too much on the fuel. To make sure the fuel is not costing too much, get the tyres of your car rotated after every 8000 kilometers. It can vary according to your car so you must check your manual. In this way, you can make sure that the cost of fuel is not too heavy on your pockets. Ensure that you park your car on a level surface before you check the oil. However, the oil level is not the only significant thing. You must also check the color of the oil. If the color of the oil is pitch-black, it is a clear sign of some contaminants. It can be sludge, chemical additives or extreme heat. If you happen to see any such change in the color of oil, you know it is time to drive your car to a mechanic. If you are stopping at a petrol station with a heavy heart, you must know there is something wrong with your car. Spending of too much money on the fuel is a clear indication of a fault in your car. However, it can also happen because of the tyre pressure. In fact, constant interruption of brakes while accelerating can also be a cause. Whatever it may be, make sure you get your car checked to avoid the fuel expense. Keeping yourself safe is as important as keeping your car safe. The air filter is responsible for the air that you breathe inside the car. You must check your manual for the date of replacement of the air filter. In fact, these air filters might need a replacement way before the actual date considering the level of pollution in your city. You might not experience rain quite often but it is important to check whether your windshield wipers are working properly. Even though this is a part of the car maintenance we often skip, it is extremely important. If you ever hear a squeaky noise or any weird movement, make sure you replace the wipers. You will only realize the importance of wipers when you happen to move out on a rainy day. You must check the engine coolant level to prevent the overheating of the engine. The car engine should function well since it is the most important element of the car. 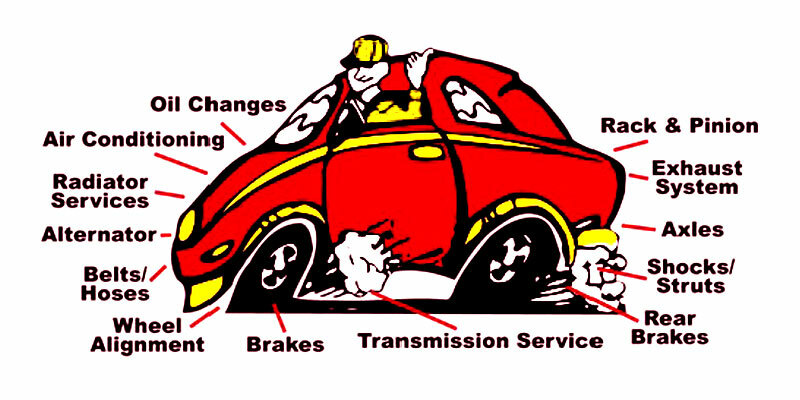 Therefore, for a safe drive and reliability of the car, make sure you are maintaining it well.